Pictures, images & photos of the iconic Sultan Ahmed Mosque (Sultanahmet Camii ) or Blue Mosque, Istanbul, Turkey. Built from 1609 to 1616 commissioned by Sultan Ahmed I when he was 19. the Blue Mosque draws the inspiration for its design from Hagia Sophia that stands opposite it. 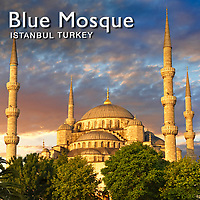 The design of the Blue Mosque is a high point of the classical period being a fusion of Ottoman & Byzantine elements. It was designed by Mehmet Aga, its second architect as the first was executed because his skills were found wanting. Normally mosques have a maximum of 4 minarets, the exception being the Grand Mosque in Mecca, the focal point of the Islamic world. It shows grand designs of Sultan Ahmet that the Blue Mosque was controversially designed with 6 minarets also. The sixth minaret of the Blue Mosque though was built when Sultan Ahmet built a seventh minaret on the mosque in Mecca. The high central dome of the Mosque is surrounded by 8 smaller domes creating cascading tiers running down to a central courtyard, the biggest of any Ottoman mosque. The interior of the mosque is lined with 20,000 Iznik tiles with more than 50 tulip designs as well as fruit, flowers & cypresses. Over 250 stained glass windows with intricate designs light the interior. Sultan Ahmet lived long enough to see the splendour of the Blue Mosque and his Mausoleum is just outside the walls.